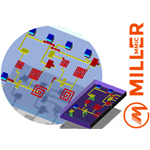 Miller MMIC received initial $8.2 Million private funding to pursue GaN, GaAs RF MMIC market. Miller MMIC is a global microwave solution provider of RF semiconductors. With InP, GaN and GaAs technologies Miller MMIC supplies a wide variety of products used in multiple applications including military and defense, commercial wireless, satcom, and radar to name a few. These core technologies allow Miller MMIC to offer cutting edge optimized solutions to support all applications up to 40GHz. We are an end to end RF supplier with products ranging from low noise amplifiers, power amplifiers, mixers, digital attenuators, filters and much more. Miller MMIC successfully developed wide band distributed low noise amplifier MM310 which cover 10-40GHz with NF 4.0ddB P1dB 13dBm min. Miller MMIC successfully finished production run for 6-18GHz wide band LNA replacement of Hittite part of HMC903. GaAs technology, 10-40GHz band with Noise Figure 4.0dB. P1dB min 13dBm. OIP3 +23dBm. Small package. GaAs technology, 6-18GHz band with Noise Figure 1.5dB. P1dB min 15dBm. OIP3 +25dBm. Small package.